Lithographed map drawn by Paul Wilski. This map was published in the atlas to the first volume of Hiller von Gaertringen’s excavations in Thera, better known under its mediaeval name of Santorini. This rare work, Thera Untersuchungen Vermessungen und Ausgrabungen in den Jahren 1895-1898, was published in four volumes by Dietrich Reimer in Berlin from 1899 to 1909. The volcanic island of Santorini has fascinated travellers, archaeologists and historians for centuries. The German archaeologist Baron Friedrich Hiller von Gaertringen (1864-1947) began work in Santorini in 1895 where he carried out excavations for several years, supporting a group of archaeologists at his own cost. The main focus of their work was the excavation of the ancient capital of the island, which is extensive. The ruins of the capital date mostly from the 4th century B. C. The map exhibited here depicts the southeastern part of the island in great detail, showing the location of ancient Thera on the promontory between Kamari and Perissa. Modern archaeological excavation in Santorini is focussed on the late Minoan (ca.1550 B.C.) ruins at Akrotiri. From Friedrich Hiller von Gaertringen’s account of his excavations in Thera, volume 1. From the collection of the Cyprus American Archaeological Research Institute (Nicosia, Cyprus) 939.1 Sr The Hil. 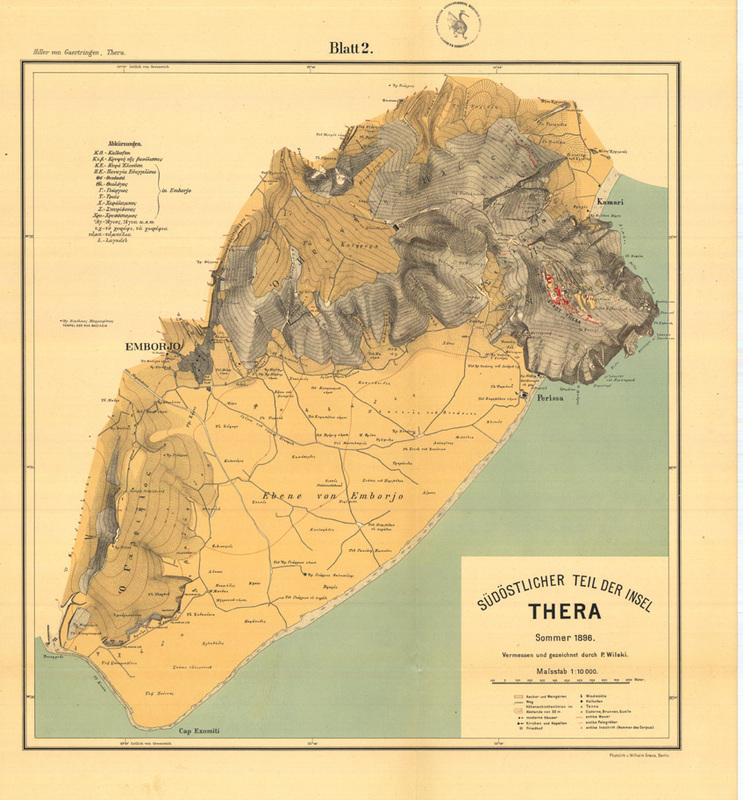 "Sudöstlicher Theil der Insel Thera," online in Digital Library for International Research Archive, Item #10, http://www.dlir.org/archive/items/show/10 (accessed April 26, 2019).